I recently purchased a Mercedes-Benz 560SEC at auction. The auction was in Queensland, so the cheapest way to get the car was to have it shipped to a depot in Bathurst. My brother and I went up to Bathurst to pick up the car in his E63 BMW 650i. 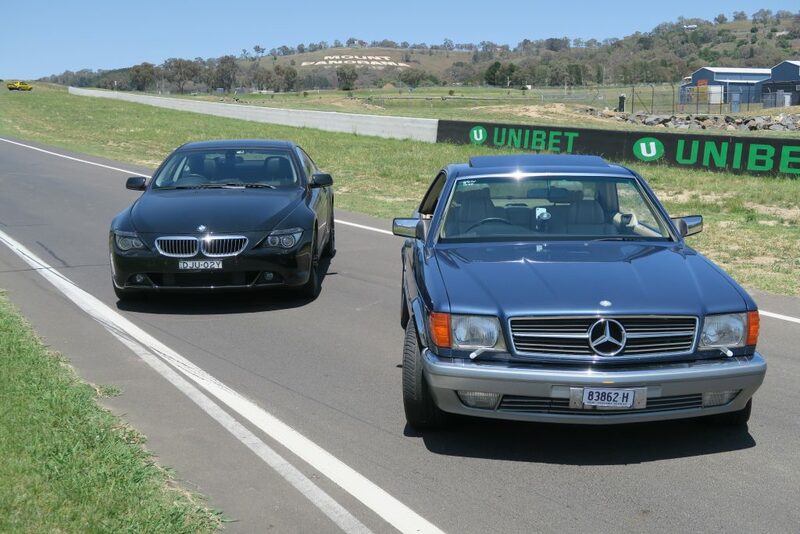 The trip presented a great opportunity to drive two v8’s around the Mount Panorama racetrack. This is now the 3rd 560SEC I have owned. The first two (1989 & 1988) were both owned in the USA when I lived in Michigan from 2007-2011. This car is a 1987 UK market model. It is the ECE version which means it does not have a catalytic converter and is tuned for high octane petrol. This is achieved via a higher compression ratio and different cams. The result is 220KW instead of 178. The car is better than I thought it would be. It is in good driver condition both inside and out. I’ve had it up on my hoist and for a UK market car I am surprised not to find rust underneath. The main downside is that I got almost no history with the car. The car is currently equipped with aftermarket wheels that are too big for the car. The tyres are 245 wide and these rub going over bumps and on sweeping turns. The original wheels were included although the tyres are bald. When I picked it up, it was not shifting well and the transmission fluid was low. I am getting puffs of white smoke after takeoff and after certain gear changes. My current theory is that the transmission modulator is failing allowing ATF to burn in the engine. Once the fluid was topped up the transmission performed well. Most things on the car seem to work, but not surprisingly for an 80s Mercedes, the air conditioning is not one of them. The tempomat works, as do the power seats, all four power windows and sunroof, seatbelt presenters and instruments. The car is equipped with orthopaedic front seats, but I am not sure how how they are supposed to work to test them. My brother and I drove up to Bathurst in his E63 650i. The 6er is an interesting contrast to the SEC. As you would epect as a modern car it is more refined than the SEC. In some ways they fit into the same market niche, but the BMW is sportier. The seats and ride are harder and the steering is more precise. The Mercedes is more about comfort and feels airier with the pillarless design and bigger windows. Its 4.8l v8 has another 50KW, which is a smaller difference than you would have thought. The six speed automatic allows it to accelerate to 100km/h a full second faster. Before we drove back to Sydney, we drove two laps around Mount Panorama. This is normally a public road with a speed limit of 60km/h. The track has a near constant Police presence to top people trying to recreate Peter Brock’s glory days. The altitude changes and tight corners are even more pronounced than can be seen on TV. The track is actually a two way road, so we drove it in both directions. On the way back were were able to drive on some great twisty roads and avoid traffic by taking a route through Comleroy road, over the Sackville ferry and Wisemans ferry road. The two V8 coupes were a good pair for this road trip. So far I am optimistic about this purchase. I’ve started to give the car a service to better understand what I have and if this is a car I will keep for a while, or fix some of the more obvious things and sell it.